Electride Behavior in a Lithium Nitride? EFree Senior Investigator Roald Hoffmann presented some recent results from his group at the January conference call of the Silver Team EFRC directors. Hoffmann's presentation focused on theoretical predictions of the behavior of electrides at high pressure. Electrides are extended structures in which an electron has separated from an ionic core and resides in an interstitial space. An unusual state of matter under ambient conditions, electride behavior has recently been observed in materials under high pressure. 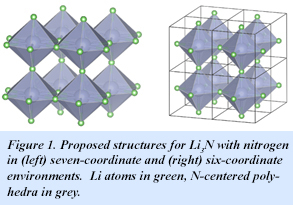 In the course of theoretical investigations on materials at high pressure as part of the Novel Electron Transport in Light Element Materials Project in EFree, the Hoffmann group at Cornell University has now estimated that Li4N could provide the newest example of an electride. The stable point in the Li/N phase diagram is the classic ionic nitride, (Li+)3N3-, which suggests that Li4N should be on the border of thermodynamic stability. But even the stable Li3N presents some unusual features. For example, theory suggests two structural alternatives of nearly equal energy, one with six-coordinate nitrogen and one with seven-coordinate nitrogen (Fig. 1). This structural flexibility is again evident when the composition is changed; some 25 structures are found for Li4N, all within 0.02 eV per formula unit. The candidate Li4N structures all contain NLin polyhedra, with n = 6-9. These may be classified into three types: NLin extended polyhedral slabs joined by an elemental Li layer (type a), structures similar to those of type a, but without the Li layer (type b), and three-dimensionally interconnected NLin polyhedra without any layering (type c). 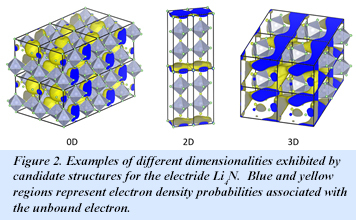 All of the structures can be characterized as electrides, but they differ in the dimensionality of the electron dispersion: Type-a and type-b structures emerge as two-dimensional (2-D) electrides, while type-c are quite varied, as 0-D, 2-D, or 3-D. Examples of each dimensionality are shown in Fig. 2. The calculated structural variety points to potential amorphous character and likely ionic conductivity in the material [Y. Tsuji, P. L. V. K. Dasari, S. F. Elatresh, R. Hoffmann, and N. W. Ashcroft., J. Am. Chem. Soc. 138, 14108−14120 (2016)].